COLUMBUS, Ohio – Lonnie Thompson, the Ohio State University glaciologist who has probably spent more time at high altitudes than any other person, was named today to receive the National Medal of Science for his work providing explicit evidence of global climate change. The award, arguably the highest honor the United States bestows on an American scientist, caps nearly three decades of research in some of the world’s most remote regions. Thompson is one of eight researchers who will receive the award later this summer during a formal ceremony at the White House. Thompson, a distinguished university professor of earth sciences at Ohio State, has led more than 50 expeditions to ice caps and glaciers on five continents, retrieving ice cores that contain a diary of past climate conditions around the globe, some dating back farther than 750,000 years. From this work, he, geography professor Ellen Mosley Thompson – his research partner and wife -- and his research team have provided irrefutable evidence that the last half-century was the warmest period in recorded history. That work signals a rapidly growing warming trend that apparently exceeds any normal variation seen in past centuries. Ohio State President Karen Holbrook said that this national award is a fitting culmination of the triumphs of great science, and that Thompson and his team are exceptional examples of such work. “Among the many honors bestowed on Lonnie, this award is both extraordinary and well-deserved. We are truly fortunate to have him on the faculty at Ohio State, where he brings renown to the university and educational benefits to the many students who have had the privilege of working with him and Ellen,” Holbrook said. As a boy raised in the rural West Virginia railroad mining town of Gassaway, Lonnie awed local residents with his uncanny ability to predict the weather, a knack at forecasting that usually surpassed the professional forecasters in the region. Intent on studying coal geology when he arrived at Ohio State, where he would eventually earn his Ph.D, Thompson serendipitously landed an opportunity to test what was, at the time, an unorthodox theory – that the earliest changes to the earth’s climate might first appear on tropical ice caps instead of at the planet’s polar regions. Former Vice President Al Gore said, "Lonnie Thompson's work is the most serious warning cry yet that it is time to change our ways, and protect our children's future. “I'm honored to consider Lonnie my friend and ally." In the 1970s, he was the first to retrieve ice samples from a remote tropical ice cap and analyze them for ancient climate signals. Nearly 30 years later, with vast refinements in both techniques and technology, this Ohio State team continues its basic mission to drill through many of the world’s pristine ice fields and rescue the data trapped inside. Over the years, Lonnie and Ellen have built an exceptional team of researchers at the Ohio State’s Byrd Polar Research Center to carry out this work. Among them, Mary Davis, Ping-Nam Lin, Victor Zagorodnov and Henry Brecher who have collectively amassed 86 years both, on expeditions and in the lab, unlocking secrets trapped in the ice. “These key people have devoted their careers to this work and they share equally in any awards it may bring,” Thompson said. Massive refrigerated storage rooms at Ohio State currently store more than four miles of the four-inch-diameter cores for future analysis. From the ice, Thompson and his colleagues can distinguish between ancient drought and monsoon conditions by measuring the dust content and the concentration of chloride. The concentration of sulfate along the cores offers a record of volcanic eruptions worldwide, and a comparison of two isotopes of oxygen yield a surrogate for past temperature records, some so distinct as to show changes month to month. An array of other tests on the ice produces a flood of information. He and his teammates have hauled sophisticated solar drill rigs and analytic equipment to ice fields normally reached only by professional mountaineers. But while those alpinists sprint to the summit and return to the mountains’ bases, Thompson’s teams will remain for weeks on end, drilling hundreds of meters through the ice fields to retrieve the climate records they hold hidden. Thompson shocked the scientific community in 2001 when he predicted that the famed snows of Africa’s Mount Kilimanjaro in Tanzania would melt within the next 20 years, a victim of climate change across the tropics. Return expeditions to that same mountain have shown that changes in the mountain’s ice fields may signal an even quicker demise of its snowy cover. In recent years, Thompson has discovered that the retreat of the Quelccaya ice cap in the Peruvian Andes – the world’s largest tropical ice field – has exposed large patches of ancient plants for the first time since they were blanketed first by snow and then ice, more than 5,000 years ago. The finding of these emerging plant colonies, still in relatively pristine condition, shows that the temperatures in that part of Peru have never been warmer in the last 50 centuries. Thompson says that this and other evidence from around the globe indicate that a major climate change occurred at that time, a change that cooled the planet enough to feed the growth of ice fields around the world. 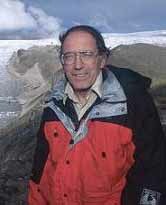 Considered somewhat a rebel chasing an improbable theory early in his career, Thompson’s discoveries have since won over most opponents in his field of paleoclimatology, and netted him substantial accolades. He is the recipient of numerous awards, including the 2002 Heineken Prize for Environmental Science, given by the Royal Netherlands Academy of Arts and Sciences. He and Ellen jointly won the 2002 Common Wealth Award of Distinguished Service for Science and Invention. In 2005, he was chosen to receive the prestigious Tyler Prize for Environmental Achievement, an award described as “the premier award for environmental science, energy and medicine conferring great benefit upon mankind.” He also received the Vega Medal in 2002 from the Swedish Society for Anthropology and Geography. The year before, he was named one of “America's Best Scientists” by Time magazine and the Cable News Network. In 2005, he was elected to the National Academy of Sciences. His research has been supported by the National Science Foundation, the National Aeronautics and Space Administration, the National Oceanic and Atmospheric Administration and the National Geographic Society, among others. Lonnie and Ellen both served as advisers to former Vice President Al Gore in the production of his 2006 documentary, “An Inconvenient Truth.” Gore said, "Lonnie Thompson's research has yielded some of clearest, most definitive evidence of the dangerous state of global climate change that we're all facing. “His tenacity through the years in countering disbelievers, coupled with the quality of his team's research from the very beginning, has shown us dramatically the effects we can expect in the near future. His work is the most serious warning cry yet that it is time to change our ways, and protect our children's future. “I'm honored to consider Lonnie my friend and ally." Thompson will return to the Quelccaya ice cap this June – his 28th trip there – to monitor its continuing shrinkage and to collect shallow cores from its summit. "The loss of our glaciers is the most visible evidence of global warming we have,” he says. “They store the history of many of the climate’s most crucial variables that affect the earth’s systems, and their loss is easily apparent to anyone who might take notice. “We need to remember that glaciers have no political agenda." Contact: Lonnie Thompson, (614) 292-6652; thompson.3@osu.edu. Written by Earle Holland, (614) 292-8384; Holland.8@osu.edu.